Designed to give players of any caliber the ultimate tool to take down the opposition, the Classic Army Nemesis series has used the best parts of the Hong Kong company's Scarab line and turned them into your enemy's worst nightmare. The ME-10, or Mlok Elite 10, gives you the comfort of a smooth M-LOK compatible rail, but you also can turn to the easy accessibility of the Picatinny rail sections included in the box. The Classic Army Elite Nemesis ME-10 M4 Carbine AEG Airsoft Gun from Airsoft GI is the perfect gun for customization and close-quarters to mid-range engagements. Whether you are a beginner or a veteran, this gun gives you maximum flexibility. If you want a versatile weapon and can only buy one gun, it's a great choice. But it also makes an outstanding addition if you are building your arsenal of airsoft guns. Externally, the upper and lower receiver are CNC aluminum. That provides a super-aggressive billet-style look and makes sure that both receivers match perfectly. 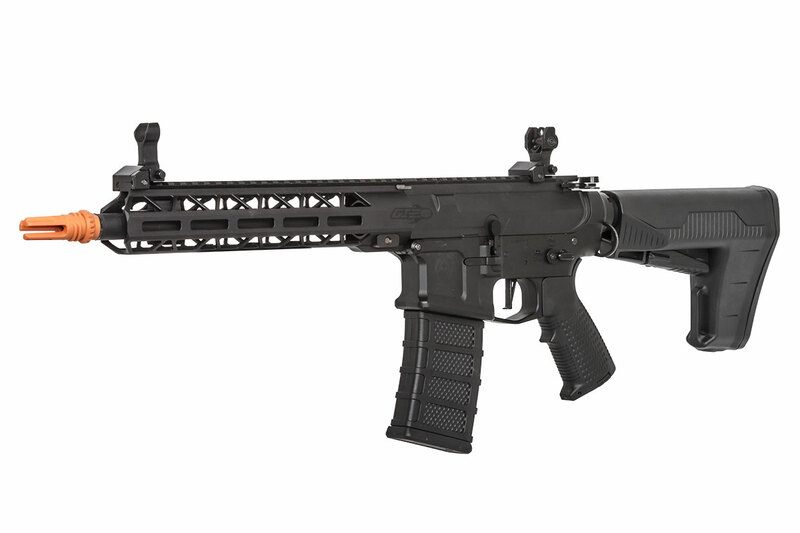 In-house members of Classic Army USA custom-designed the handguard. This gun also features the Classic Army B.A.S. Stock, which allows for greater battery storage than any other telescoping stock on the market. Featuring a deceptively cavernous interior, this stock can fit more than three LiPO batteries inside with ease, making sure you never run out of power. The whole package is rounded out by a brand new ambidextrous charging handle. This makes it a cake walk to access your hop up with either hand. Internally, the gun has a 9mm bearing bushing gearbox, a brand-new electronic control system, or ECS, a 6.03mm tight-bore barrel, a 31k high speed / high torque motor and a TRUE quick-change spring system. The ECS protects your trigger contacts and has a trigger-programmable three- or five-round burst-fire function. It will shoot 375-400 fps using 0.20g BBs and 900-1000 rpm using a 7.4V battery. The updated 18:1 gear ratio is faster than previous Nemesis guns. With the combination of the new motor and new gears, the Nemeis line is one of the fastest guns on the market! The ME10 M4 has a true quick-change spring system you can access without having to take out the gear box, so you can quickly and easily upgrade or downgrade your spring to change the power level. On top of all that, the 31k motor provides 26 rounds per second on an 11.1v to make sure you get the BBs down the range. From an experienced player's POV, the Nemesis line of guns is ideal for the player who demands performance. Like the other airsoft guns in the Nemesis lineup, the ME-10 delivers. It has a compact form factor while still maintaining its size as a carbine. A tight, collapsible stock makes it perfect for MILSIM play in MOUT-style environments where tight corners and CQB mix with vehicle and outdoor combat frequently. This gun is the very definition of versatile, allowing you to maneuver through various environments and still hit the crucial shots you need to make. The electronic trigger contained within its gearbox provides unmatched trigger response compared to traditional triggers in other guns, allowing you to break shots faster in combination with a high-torque motor. This motor comes included as well, providing the necessary torque and power to push this gun beyond the levels of the average airsoft gun. Even the flash hider is versatile, allowing for the attachment of the Classic Army Fast Attack suppressor at will, so you can change your appearance on the fly as well! The M-LOK handguard on the ME-10 provides endless customization options as well. Experienced players can attach all kinds of grips to the bottom portion of the handguard, giving themselves more control. Vertical grips will be perfect, especially the mini-style ones, for this size airsoft gun. The side components will likely play host to a flashlight on one side of the gun to illuminate those dark corners, while the top houses the included flip-up iron sights. Red dot-style scopes are a great option for this gun, but its included tight-bore barrel means you can really make use of a magnified optic as well, if that is your preference. The 14mm CCW-threaded muzzle makes a great companion for a mock suppressor or barrel extension as well. When properly kitted out, the ME-10 is capable of excelling in almost any environment and exceeding the performance of any other airsoft gun you have tried. It is a blank canvas to be molded to your own personal play style. 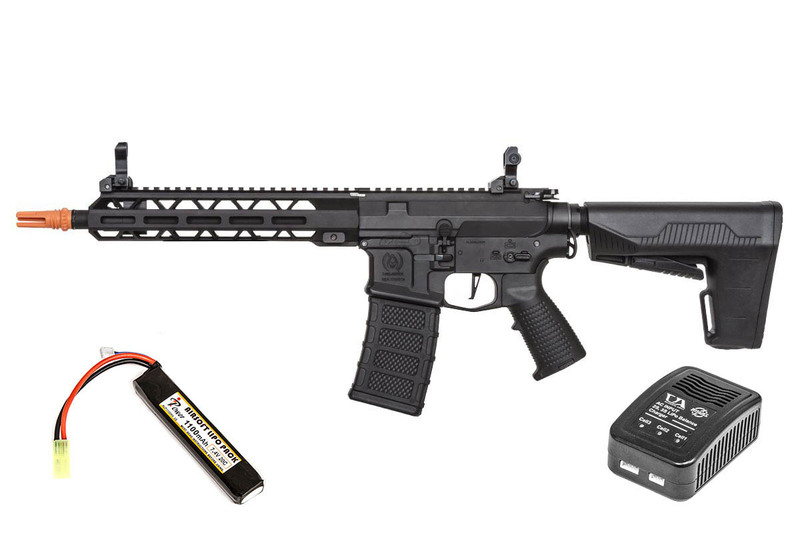 Its compact form factor can make it ideal for MOUT or indoor CQB if you lower the spring, but its long-range out-of-the-box performance means it can hang with much larger guns in a long-range shootout. Most players will find this the perfect gun for outdoor fields that require maneuvering through tighter terrain and buildings with rapid frequency, because the gun is capable of fighting in tight spots but also very much capable of hitting at larger distances than most airsoft guns. It's hard to think of a gun that provides more customization and playing options at one simple price. Come into one of our stores and try shooting one for yourself at our range or call our knowledgeable staff with any questions. Is it wired to deans? The latest models as of the time of this answer have all come with tamiya connectors. Please contact us at 1.909.869.0671 to get a more up to date answer as the manufacturer spec may vary. Yes, you would be fine. Personally we like the PTS EPMs, as they work very well in these. However, if you're more on a budget, ASG/Elite Force/ King Arms mid caps work well too. what is the stock gear ratio?